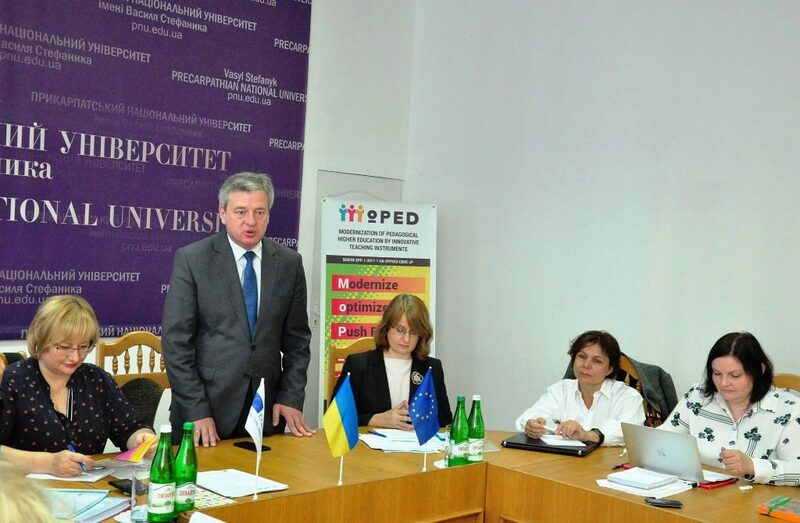 The University held a regular meeting of the representatives of the universities consortium working groups –the participants of the project “MoPED –Modernization of pedagogical higher education by using innovative teaching tools”, program EU Erasmus+KA2 – Development of higher school potential. It was also attended by the representatives of the national Erasmus+ office in Ukraine and the European coordinator of the Education, Culture and Audiovisual Executive Agency Belen Ensiko. It should be reminded that last year the Precarpathian National University won the contest and for the first time in the history of the program TEMPUS and Erasmus+ KA2it serves as the main beneficiary and coordinator of the project. The project is designed for 3 years. Our partners in the project are 5 universities in Ukraine (Borys Hrinchenko Kyiv University, Hryhoriy Skovoroda Pereyaslav-Khmelnytsky State Pedagogical University, Pavlo Tychyna Uman State Pedagogical University, K. D. Ushynsky South Ukrainian National Pedagogical University), Deusto University (Spain), AGH University of Science and Technologies (Poland), Cyprus University (Cyprus), as well as Joint Venture “Quality Ukraine” – a quality expert. “In today’s environment, the implementation of this project is, first of all, very important for our national universities. After all, in the context of the new Ukrainian school concept implementation, the mission of higher education institutions, in particular within the framework of MoPED project, is, on the one hand, the training of students, who tomorrow will become teachers of the new Ukrainian school, and, on the other hand, the extensive retraining of Ukrainian teachers who are already working in these schools”, – said the rector of the University Igor Tsependa during the opening of the meeting. Within the framework of the meeting program the presentation on the project implementation results at this stage, the project management system set-up was made by MoPED Project Coordinator, Liubov Ziniuk, Head of the Project Management Department of the Precarpathian National University. As a representative of the university-grant-holder, she noted that at this stage, with the support of the national Erasmus + office in Ukraine, the Ministry of Education and Science of Ukraine and the active participation of partner universities, the project is successfully implemented in accordance with the work plan. During the meeting, the intermediate results of the project were also presented by the participants of the working groups of the national partner universities. In particular, according to the developed concept the ICR project was created, information for 3D Mapping was collected, the topics of the training courses, their target direction for the training of future teachers of the new Ukrainian school was determined.